Plodding Along Or Picking Up Speed? News On Job Growth Due : The Two-Way April job growth and unemployment figures are coming Friday morning. Economists expect to hear that employers added about 150,000 jobs to their payrolls and that the jobless rate stayed at 7.6 percent. But they worry about another negative surprise. Looking for work: The scene at a job fair in New York City earlier this year. Figures on job growth and unemployment in April are due Friday morning. The always eagerly anticipated numbers from the Bureau of Labor Statistics on job growth and the nation's unemployment rate are due out at 8:30 a.m. ET. 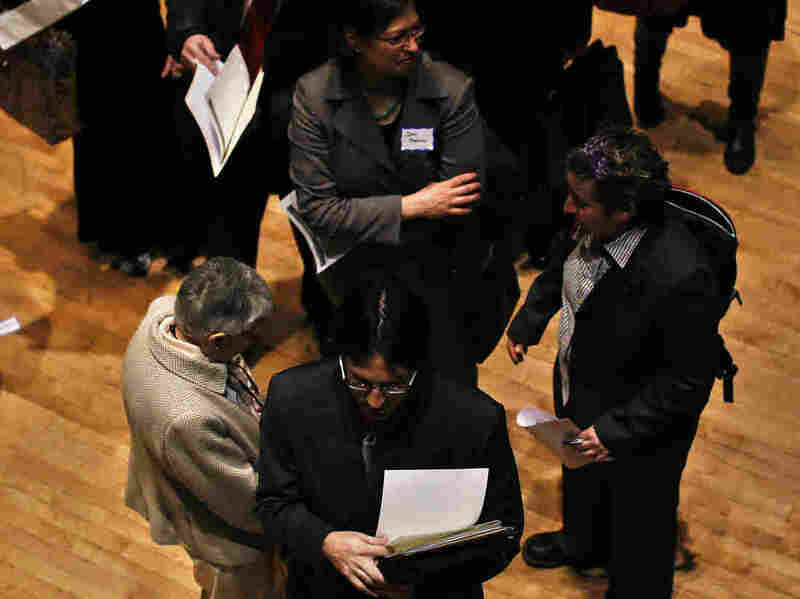 On Morning Edition, NPR's Yuki Noguchi said economists expect to hear that employers added about 150,000 jobs to their payrolls in April and that the jobless rate stayed at 7.6 percent. But economists worry, she added, that there might be a surprise — and that much like a month ago, when BLS said just 88,000 jobs were created in March, it won't be good news. "The question is whether the labor market is slowing from the plodding pace that it's been going at, or whether it's essentially holding up," Yuki told Morning Edition host David Greene. Among the things to watch for: How the federal government's budget-cutting efforts are rippling through the economy. "U.S. employment growth likely picked up in April, but probably not by enough to counter other signs that suggest the economy has lost a step in recent weeks. Nonfarm payrolls are expected to have increased by 145,000 jobs, according to a Reuters survey of economists, after braking to a nine-month low of 88,000 in March. Taken together, the job creation pace over the past two months would still be far below the average of 200,000 for the first two months of this year." Bloomberg News says the consensus of economists it has interviewed is that about 140,000 jobs were added last month. As with most things involving economics, there is an "on the other hand" side of this story. In this case, there are some reasons to think the report might make things look a bit worse than they really are. The Wall Street Journal says some economists think that unusually cold weather in April might have held down job growth (most notably, in the construction sector). As temperatures rise, so might payrolls. There's also, the Journal says, a technical quirk. There were four weeks between the surveys that produced the March employment report and the April data. Usually, BLS has five weeks between its surveys. While it will make some adjustments to account for that factor, the shorter length of time between reports might mean that some new jobs were missed. We'll post about the employment report shortly after it's released.